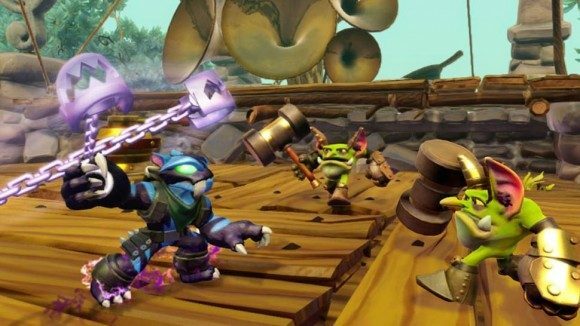 Gaming behemoth Activision has announced that the latest entry to the billion-dollar franchise Skylanders, subtitled Trap Team, will be arriving on the iPad, Kindle Fire and Android Tablets on October 5, the same day it releases on consoles. In spite of the hardware differences between tablets and consoles, the mobile version of Skylanders Trap Team will play and feel virtually identical to the console version, although it will feature a whole new set of peripherals. A Skylanders Trap Team starter pack for Tablets can now be pre-ordered on Amazon for a hefty $75, and alongside the actual game, comes packaged with a dedicated wireless controller, a wireless Traptanium portal, two figurines, two traps, a trap collection tray that “lets Portal Masters keep track of the Traps they’ve collected and which villains they have trapped,” a poster, two sticker sheets with secret codes, two trading cards and five AAA batteries. Of course, players who prefer the touch screen over an actual controller will have access to dedicated on-screen touch controls in-game. This version of the game will be supported on the Kindle Fire, iPad 3rd and 4th Generation, iPad Mini Retina, iPad Air, Google Nexus 7, and Samsung Galaxy Tab Pro, Tab S, Note 12.2 and Note 10.1. Developed by Toys for Bob and Beenox, Skylanders Trap Team takes place after the events of the most recent game, Swap Force, and features a plot in which an antagonist known as Kaos releases a plethora of evil creatures across the Skylands, necessitating their recapture by the Trap Master Skylanders. This new title introduces a new gameplay mechanic of trapping enemy characters so that they can controlled as playable characters. The game also supports cross-platform functionality, so characters along with skills and upgrades can be carried over to different consoles. For those who are unaware, Skylanders is an action platforming franchise catered towards younger gamers that involves the use of toy figurines, many of which are sold separately. When these figurines are placed on a Portal of Power peripheral, they become playable within the game. In addition to the above mentioned mobile devices, Trap Team will also be released on the 3DS, Wii, Wii U, Xbox 360, Xbox One, PlayStation 3 and PlayStation 4 on October 2 in Australia, October 5 in North America, and October 10 in Europe.